In this amusing satire, the American two-party electoral system is now used to elect a World President. The father-daughter team of Toby and Lara Platt might seem caricatures of cutthroat campaign directors to those on the right, but those on the left will recognize them. They get their candidates elected by any means necessary. At the opening of the book they are working on the re-election of the current president, Corbin Dubois of France. Then an alien lands outside of the United Nations, saying she is an ambassador from Tau Ceti. So of course Dubois orders her attacked. Toby resigns from his campaign in disgust. The alien survives. Dubois’s highly unethical reelection campaign, now run by Lara, lumbers on despite the potential public relations disaster because the public, by and large, is not aware of the true nature of the alien. Then Toby vows to put his daughter out of a job. He challenges the two major parties—one conservative, one liberal—and runs for president himself as a third-party moderate. The book, from that time on, quite a statement against the monied elites versus the common man. You can take the message in the fiction because the story is pretty enjoyable. Larry Hodges is a master of irony and slips in enough humor that it’s a great ride. 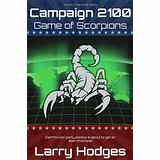 Amid rising tensions and chants of “Alien go home!” the campaigns crisscross the world as father and daughter–puppetmasters of the press and public opinion–battle for votes and clash over how to solve burning issues 2100. It all comes down to the Antarctica vote. And the alien, who joins Toby’s campaign. has a few revelations of her own. Oh, the humanity!